The large-case GA-110 analog-digital combination watch takes on a new look with the addition of metal elements that give the faces an industrial feel. The new design uses shiny metal for hour markers and the dial, in addition to the hour and minute hands. 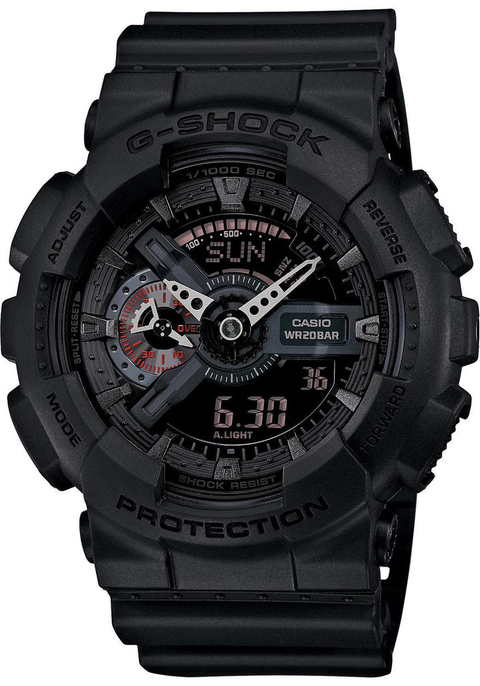 G-Shock is dedicated to the ongoing pursuit of further advancement of the Classic G-Shock watch, considering every possible option to improve upon the product. G-Shock Classic Watches are a reflection of this pursuit in its purest sense. Their designs reflect a deeper meaning than the usual superficial styling. These are smart designs born form the pursuit of pure functionality.